French fashion house YSL took immersive consumerism to achingly cool new heights over the past two years, opening its first ever YSL Beauté Hotel in Paris. As well as being one of the hottest tickets of Fashion Week, with supermodels and influencers alike moving their schedules for a chance to step into the iconic atelier’s one-off installations, it’s since popped up in Tokyo, Madrid, Hong Kong and New York, such was its popularity. 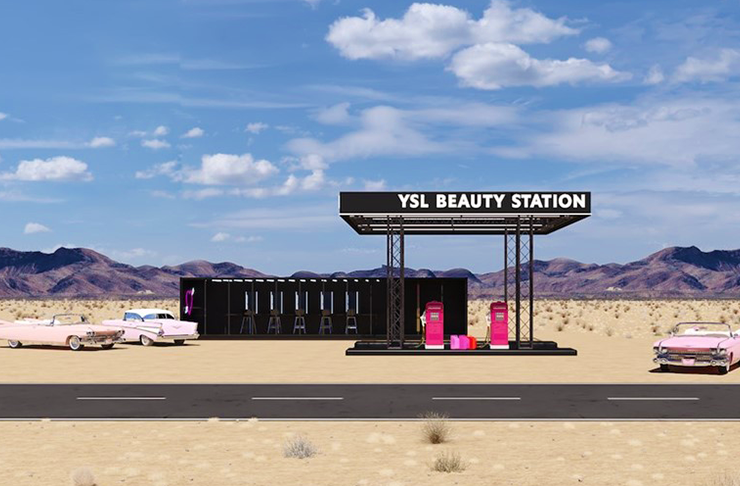 Paving the way for more eye-popping, boundary-pushing brand integration within the billion-dollar beauty industry, it’s at this year’s Coachella Music Festival where YSL will once again turn heads with their extravagant pop-ups (last year’s neon garden was splashed across Instagram), this time a beauty gas station on route 111 in Palm Springs, California. Decked out as a makeup drive-in, the gas pumps will be replaced with makeup refills, and the forecourt will feature YSL branded vintage Cadillacs, makeup vending machines and 2-storey neon YSL lipstick lights. The pop-up coincides with the launch of four new covetable products; Touche Eclat High Cover Radiant Concealer and Brightening Pen, Rogue Volupte Shine Lipstick and Plum-In-Color Lip Balm, where festival goers will be able to shop the entire YSL beauty range, get beauty advice and makeovers by the talented YSL team. Don't want to miss out? Get the latest beauty news and product drops right here.